One donation can help multiple patients. Following collection, red blood cells, plasma and platelets are separated, stored and distributed separately. Blood is composed of 3 main components: red cells, plasma and platelets. Most donated red blood cells must be used within 42 days of collection. Apheresis is a mode of collection that allows a donor to give only the specific blood component that is in need by patients, such as platelets. Platelets are especially in need by cancer patients and must be used within 5 days of collection. New donations are continuously in need. All blood types are needed to help patients; the need for type O negative is especially acute. Only 7% of U.S. residents have “universal” blood. 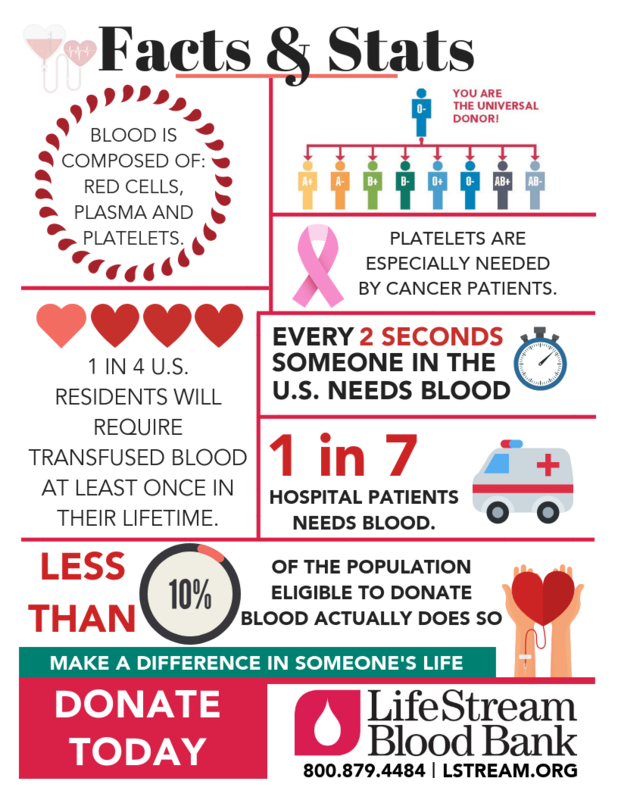 1 in 4 U.S. residents will require transfused blood at least once in their lifetime. Less than 10% of the population eligible to donate blood actually does so. 1 in 7 hospital patients needs blood. Blood makes up about 8% of the human body. No one wants to be in the position of needing blood to maintain health, to battle disease, or to recover from injury; however, 1 in 4 of us, at some point in our life, will require a blood transfusion. Every 2 seconds, someone in the U.S. needs blood. A liver transplant recipient needs approx. 45 units of red blood cells, plasma and platelets. Heart surgery patients may need 7 units of red blood cells and platelets. A marrow transplant recipient needs up to 45 units of red blood cells and platelets. Trauma victims can need up to 50 units of red blood cells, and platelets and plasma. Sickle cell anemia patients need 2 – 10 units of red blood cells per treatment. To learn more about the lives saved though blood donations, click on a photo below.